Or Pueblo made, but there is no maker's hallmark (as was common of most Native jewelry from this era). Approx Age: Vintage (Circa 1930s - 1950s). Size: Inside circumference measures 5 1/2 inches plus there is a 1 1/8 inch opening. It is 5/8 inch across at it's widest point. Additional Info: The Fred Harvey era refers to Native Jewelry items made in the early 1950s back to around the turn of the last century. 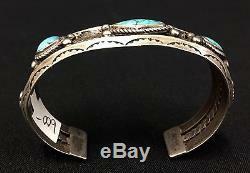 This great old bracelet appears to be from that era and has hand-drawn, Ingot, triangle wire with 5 old natural turquoise cabochons (note some tiny fractures in the turquoise) hand-stamped / hand-embellishments. It tested positive as Sterling. 925 or at least Coin. Please look closely at the pictures as they are an important part of our description. PAWN: What is "Pawn" or Dead Pawn? " Technically, it just means an item which has been "pawned and let go (not paid for) by the owner. 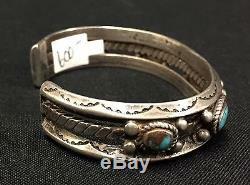 A lot of people associate dead pawn with vintage or antique Native American Indian jewelry. This is not always the case. Not all old Indian Jewelry has been "pawned" and "lost, " and not all Indian Jewelry that has been pawned and lost is necessarily old. "Old Pawn" on the other hand, traditionally referred to the personal jewelry certain Natives used to leave on "Pawn" with the trading post back in the day. This was their personal jewelry and therefore thought of as being of higher quality. Then buyers would come in looking for some of that "old pawn" jewelry (because they thought it was made better than the stuff made for the tourists). However, the words "old pawn" are often now interchange with "dead pawn" or just pawn.
" The word "pawn does not describe the age of a piece. At Western Trading Post, when we use the terms pawn or dead pawn, it simply means the item has come out of pawn at some point. If we say "old pawn, " it means an older item which has come out of pawn at some point. We try to describe the approx. Age of a piece using words like contemporary (1980s to now) or vintage (1970s and 60s) or old 1950s or earlier and antique (approaching 100 years old, circa 1920s or earlier). Western Trading Post is family owned and operated. Located in Arizona just north of the Tohono O'odham (Papago Indians), just south of the Akimel O'odham (Pima Indians), just east of the Ak-Chin O'odham (branch of Pima Indians) and only a short driving distance from the Apache (N'dee), Navajo (Dine'), Zuni, Hopi, Yavapai, Mojave, and Hualapai Indians. We specialize in Native American Indian and Cowboy items. We also hold monthly auctions at our store. THANK YOU for your business! The item "Turquoise and Sterling Silver Bracelet Old School Fred Harvey Era Item -UNIQUE" is in sale since Thursday, June 29, 2017. 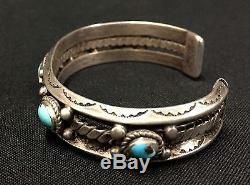 This item is in the category "Jewelry & Watches\Ethnic, Regional & Tribal\Native American\Bracelets". 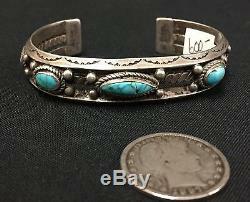 The seller is "westerntradingpost" and is located in Casa Grande, Arizona. This item can be shipped worldwide.